learning data collection and recording. There are so many great books out there! book you will be connected directly to the book's information and ordering page. Tally O'Malley. By Stuart J. Murphy. Illus. by Cynthia Jabar. 40p. 2004. Harper Collins, (987-0060531645). Gr.K and up. The O'Malley's take a trip to the beach, and on the drive the kids tally up different color cars and other items to pass the time. 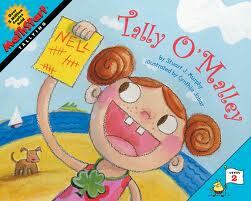 The concept of gathering data and recording in tally marks is addressed in this fun and engaging book. The Great Graph Contest. By Loreen Leedy. Illus. by author. 32p. 2005. Holiday House, (978-0823417100). Gr.K and up. This book addresses organizing gathered data into various graph forms through a whimsical and engaging story. It's Probably Penny. By Loreen Leedy. Illus. by author. 32p. 2007. Henry Holt Co., (978-0805073898). Gr. K and up. This book expands on collecting data and applying it to make descriptive statements, such as "will", "might", and "can't be possible". This is an appropriate book to bring the Probability and Statistic stand together.